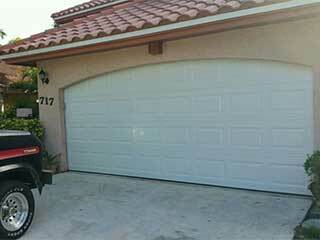 You might wonder how you can keep your door in good working order when garage door repairs are not an easy task! There are always smart ways to keep the entire system working properly and moving safely. All it takes is some attention and a few tests. Unless something unexpected happens and you wake up one morning to see a hurricane outside your door, you can take some preventative actions that will help you enjoy your overhead door and allow you to rarely have to deal with any major issues. Want to know how this is possible? Let's find out! Let's look at it backwards. Don't think of what you have to do, but of what you won't have to deal with by keeping your garage door stable, safe and in great working order. We can all agree that the door must be balanced, close and open all the way, and make the least noise possible. The door and its parts must work safely so that you won't be afraid to open or stand close to the door. In order for these things to happen, the door must be maintained regularly. Don't wait till the door doesn't open anymore to maintain it. Specifically, the travel limit and force of the door must be adjusted and checked regularly, the reverse system must be tested and the garage door parts must be lubricated. Applying lubrication once every year works wonders. It helps parts move smoothly, reduces noises and protects them from erosion. The opener must be checked often since it's the component ensuring your safety. Specifically, you should test the reverse system and make sure the photo-receptive eyes are aligned. These tasks are easily done. You don't have to touch the wires to make sure they are connected to the terminals. The lenses of the sensors must be clean and the two devices must face each other so that the door will stop should anything obstruct its descending movement. You can simply check that the sensors work fine by swinging a broomstick back and forth and seeing how the door will react. If you grasp the bottom part of the door when it comes down, it should reverse. If you grasp it when it is going up, it should stop. If this doesn't happen, it's a simple indication that there is something wrong and the garage door opener must be checked. If the door doesn't go all the way up, for example, it's clear that some new adjustments must be made. Simple things like that are noticed easily because you won't be able to move your car out or the door won't close well. Overall, you should pay attention to any strange behavior in order to prevent problems. This will keep you safe and your door in great working order.